This is quite an odd image, painted from what appears to be the perspective of a flying artist – it was an old picture postcard, and so probably dates from Victorian times. I’m guessing what the buildings are: Christ Church on the right, the old castlewood day hospital bottom left, and the Red Lion top left. Please email your favourite cooking recipes, tips, ideas and suggestions for celebrating the Christmas Feast to mike@theverygreengrocer.co.uk, and he will select two winning entries! All entries should be emailed by Wednesday 22nd of December for delivery on either Thursday the 23rd or Christmas Eve! A selection of Fresh Vegetables and Fruit suitable for 4 People for Xmas lunch. A further prize of a £10 Voucher for the Very Green Grocer will go to the second place! 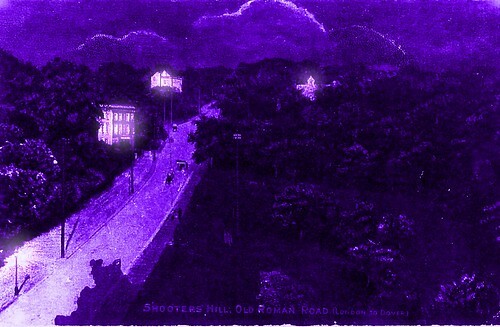 I am Mike and I have lived on Shooters Hill for over 30 years. I am starting a Fruit, Vegetable and Organic Grocery delivery called The Very Green Grocer on Thursday 16th December. This is exclusively for those who live on Shooters Hill. I will be selling locally produced vegetables, fruit and produce from farms in Kent and also Organic and fair-trade produce and groceries. I am offering a service where the customer can shop on the vehicle and choose exactly the products and quantities they want. I have personally delivered over 1000 leaflets to households on Shooters Hill and I take this opportunity to apologise to those who do not like this type of advertising. Unfortunately I could not think of a better way to promote the business to all those households. I have been in catering for over 36 years and will be able to advise people on how best to use the produce they buy from me. It is called the Very Green Grocer as I intend to run the business in the most environmentally friendly way I can. Now that school’s almost out, the farm are putting on some Harry Potter themed activities for children in the run up to Christmas. Christmas activities on 21, 22, 23 and 24 December – come and join in the fun! Description: Enjoy Christmas with this magical start to the Christmas holidays at Woodlands Farm. Drop-in children’s activities. No need to book – just turn up! All day – treasure hunt running in the Forbidden Forest! £2 per adult, children go free! Greenwich Council have been releasing some more cuts information. So far £21430000 have been proposed (based on an anticipated cut of £65000000 pending the arrival of central instructions) and partly scrutinised by some of the local blogs (853 and phantom and itm). The sheer scale of the cuts in relation to normality (i.e. ignorance) makes them difficult to understand, but I recently watched the joy of stats, and noted the billion-pound-o-gram with interest. I thought a chop-o-gram might help to bring a bit of perspective to bear on this rather unfathomable hatchet job. After scraping data from the newsshopper cuts analysis, here are a few attempts to show the enormity of what’s being done to Greenwich. This chop-o-gram factors in the £43570000 of as yet unallocated cuts. A new local podcast and blog has arrived in the form of a spin-off from the queen elizabeth hospital radio show, in the meantime. Matt the producer has kindly allowed me to re-host his initial show as it includes several reminiscences relating to the wwii history of Shooters Hill. This finely crafted bit of broadcasting comes complete with atmospheric sound effects and neatly connects together of a series of independent accounts. I have reproduced Matt’s credits below. These accounts, which are voiced by actors, are from Emily and Florence Hunt, FW Condor and Len Perry. I would like to thank June Balshaw at the University of Greenwich for her generosity. Also the BBC historical archives, The Woolwich Firepower museum and Reg Weaver and Roy Wilson. Finally, the producer stresses that In The Meantime is your voice in your local community so feel free to contact the show to express your views on local issues www.inthemeantime.org.uk As I write the site is covering the work-in at ravensbourne, as students and pupils up and down the country ask david cameron to reconsider his massive cuts to education.